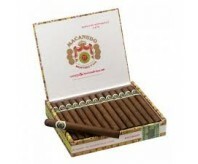 Macanudo was originally the name of a frontmark produced in Jamaica by the makers of the Cuban brand of Punch. In 1971, General Cigar, which had acquired rights to the name outside of Cuba, introduced a completely distinct Macanudo as a brand unto itself. Developed in Jamaica under the leadership of Ramón Cifuentes, a veteran of Cuban cigar maker Partagas. 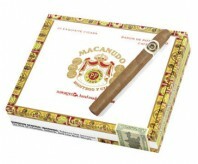 Production of the Macanudo line under General Cigar shifted from Jamaica to the Dominican Republic in October 2000. Size: 6 1/2 x 42 Shape: Lonsdale Wrapper: USA/Conn Shade Filler: D.R., Hon, Nic B.. 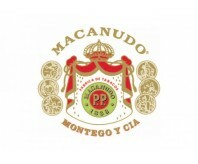 Product Description: Crafted exclusively in the Dominican Republic, every Macanudo Cafe ciga..